With iTunes Connect version 3.2.1, Apple is providing developers, musicians, authors and other content creators tools for drilling down into download and monetization stats directly from their iPhone or iPad. The latest iteration adds sales and proceeds analytics viewing options to the app's Trends pane. By tapping on the numbers listed to the right of a digital asset, for example "Paid Apps" sold through the App Store, users can cycle through units, sales and proceeds statistics. 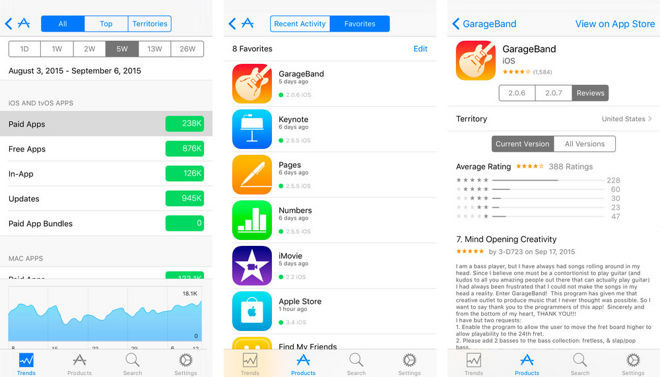 Apple is continually building out its iTunes Connect feature set, most recently activating a weekly app analytics email service for keeping track of vital performance metrics. In September, the iTunes Connect web hub was overhauled with new features and a refreshed user interface. The service's mobile app was also updated in September with support for push notifications designed to alert providers of content changes. The latest iTunes Connect version is a free 5.9MB download from the App Store.